BrightStar’s years of experience in managed cloud can help you get the most from cloud—with greater certainty. 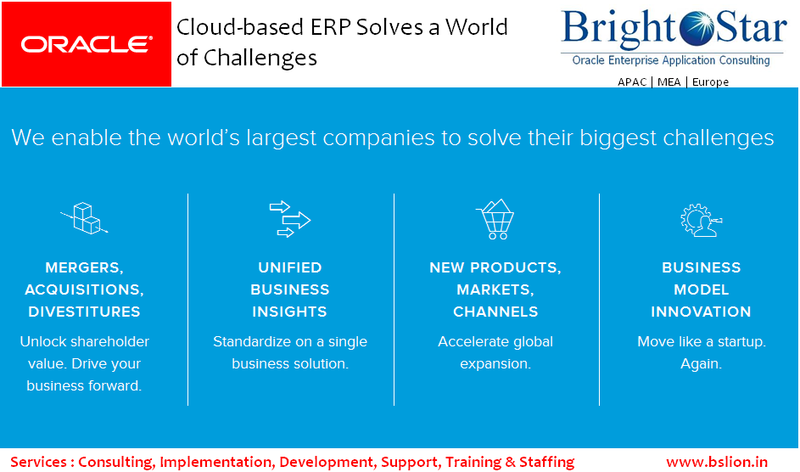 BrightStar’s cloud solution helps reduce the cost and complexity of managing Oracle systems, increasing flexibility to support business growth. BrightStar provides a highly virtualized private shared-cloud infrastructure, tailored to your business requirements and aligned with business-centric SLAs. Standardization and automation tools for provisioning, cloning and refreshing help improve your Oracle service quality, overall. NOTE: The table above lists current applications supported, but additional applications may be available. 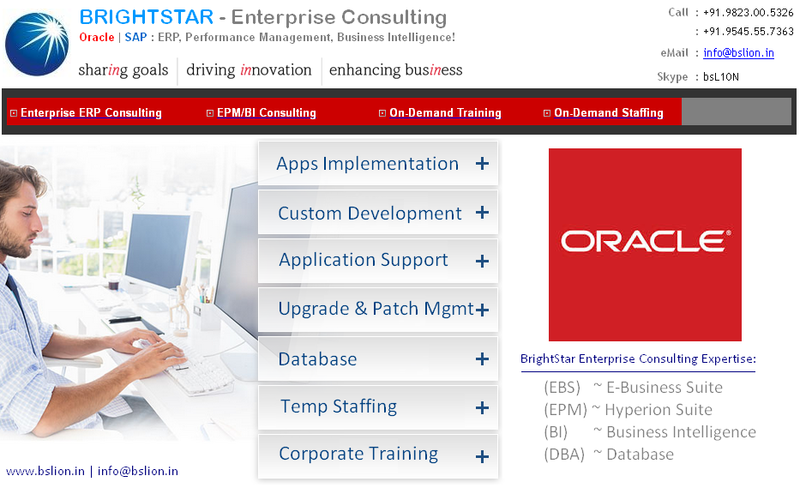 BrightStar is making significant investments in Oracle Fusion Applications and adapting Fusion Rapid Start process that will help organizations reduce the IT support cost, increases the productivity and the service quality. 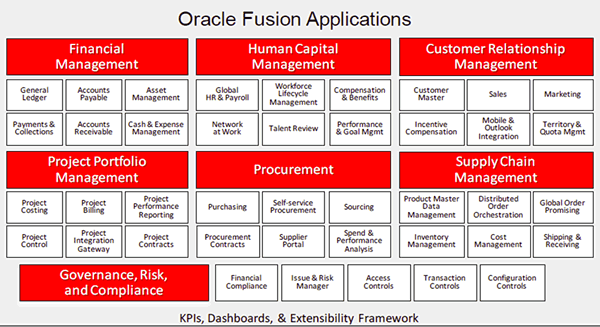 Oracle Fusion and Rapid Start Implementation process will help businesses maximize and extend the value of Fusion Applications solutions, and accelerate business value by integrating advanced technologies (cloud, mobile etc.) into the solutions. Customers can drive innovation, productivity and faster adoption of emerging technology by implementing Oracle Fusion Applications. The modular approach of Oracle Fusion Applications means customers can choose to adopt the applications at a pace and time that is right for their business. Customers can also consider Software-as-a-Service options especially for certain niche areas like Talent Management OR Compensation Management. Experience, continued investment and proven implementation approach in the Enterprise Application space. Advisory services for assessment of the enterprise application landscape, defining road-maps and implementation of the best Oracle Application solution. Integration’s to facilitate the co-existence of Oracle Fusion Applications with the client’s present technology and application investments. What are our budget restrictions? Be sure to identify all cost or capex constraints up front, and ensure that your migration plan takes these restrictions into account. Which data and workloads need to migrate? To determine which applications should be migrated: first, list all departments that manage data center and infrastructure services, then identify all workloads that are candidates for cloud migration. Where should our virtual machines reside? Some companies require their managed virtual servers to reside on the company’s premises rather than at an external site. No matter where your virtual machines are located, be sure you know what level of support you can expect from the managed cloud service provider and how many account administrators, Oracle managers or other in-house employees you may need to provide. Do we have buy-in from all necessary parties? Achieving pre-migration participation agreements and buy-in from all levels of the organization, including executive sponsors, is critical to any successful Oracle migration. 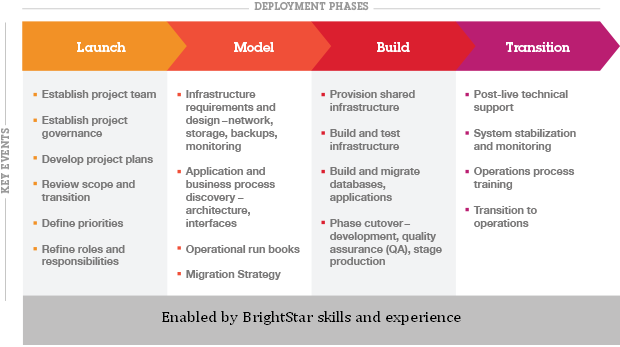 BrightStar Cloud offers a proven process to support the transition and transformation of your Oracle environments to the cloud. From preparation to technical on-boarding and handover, your dedicated BrightStar team of qualified Oracle-certified IT specialists can offer best-practice guidance on the latest Oracle products and technologies, and provide a consistent and reliable advisor – ensuring that your migration stays on track and is completed successfully. Our expert teams apply a proven process to the migration of Oracle applications to the Oracle Cloud Applications environment, validated over hundreds of client engagements.Contact us at info@bslion.in or visit our business page at http://www.bslion.in today. More and more companies are realizing the benefits of moving their Oracle applications to the cloud; however, myths about the managed cloud model persist. Here are a few of the most prevalent myths – debunked. Moving to a managed cloud model needn’t mean losing control. Independent cloud security experts emphasize that being a collaborative partner—rather than a passive passenger—is key to securely implementing Oracle on the cloud. When exploring a potential cloud solution, be prepared with information about your company’s data and security requirements to ensure that the solution addresses your specific needs or concerns. Open communication offers the best path to ensuring you get the most from a managed cloud experience. Of course, no IT environment is completely risk-free; but Oracle applications on the cloud, implemented properly, are no less secure than their traditional counterparts. It’s not necessary to dismiss Oracle cloud solutions out of hand because of security concerns, but it is important to ensure that all potential solutions are properly vetted to ensure they offer sufficient flexibility and control to achieve compliance with the security policies required for your organization, industry and geographic region. A good cloud service provider should welcome discussion of your company’s individual security requirements and be able to clearly outline potential risks—and the systems, specifications and protocols in place to deal with them. In the early days of cloud, some business leaders feared that their service quality would decline if they moved their Oracle applications to a managed cloud. Today, the Oracle cloud model has distinguished itself as a means to more affordably speed provisioning, scale business operations and optimize Oracle functions for the entire enterprise—all the while meeting SLAs on a solid foundation of expertise and customer service. Research shows that moving Oracle applications to the cloud can significantly reduce TCO, delivering a potential cost savings of 20% – 25% over five years versus a traditional Oracle self-management-and-operation approach. Cloud solutions for Oracle typically operate on a subscription model, where software, hosting, maintenance and support costs are bundled into one consistent—and affordable—monthly payment. By shifting infrastructure requirements to the service provider, you can reduce initial capex required and dramatically reduce opex. Moving to a managed cloud model can also reduce your need to staff Oracle-certified IT personnel, and free up multiple skilled IT resources to focus on strategy and innovation initiatives. Cloud-enabled automated provisioning of Oracle environments can significantly reduce the cost and labor associated with Oracle cloning, refreshes and patching. Maintaining database libraries shrinks from 1/2 day to 8 minutes. Cloning a database drops from 2 – 3 days to 20 minutes. Installing operating systems reduced from 1 day to 30 minutes. Oracle systems refresh slashed from 1 – 4 days to 3 minutes. Using the cloud, enterprises can now configure and deploy Oracle for new corporate infrastructures in days—even for multiple, globally dispersed locations. Oracle on the cloud offers a flexible environment that can easily and afford-ably scale to meet your company’s changing capacity requirements and security needs—enabling your business to develop, deploy and manage applications quickly and easily for a variety of business needs. Database In-Memory is one of a number of options that can be deployed to address Oracle E-Business Suite performance concerns and scalability requirements without the need for any application changes. The paper starts by providing strategic advice and guidelines that help you decide which objects to populate into Database In-Memory (DBIM), and how to size the In-Memory Column Store (IMCS). It provides a list of best practices and explains the complexities and limitations of using DISTRIBUTE/DUPLICATE with Oracle RAC. The Order Organizer Form has a huge number of queryable fields that would all need to be indexed for optimal performance. DBIM provides a 10X improvement in the end-user response time. The Initialize Credit Summaries concurrent program is unusual the optimization is based on an INSERT statement. It is also interesting as the example shows why simply populating objects into the IMCS can result in a performance reduction – in this case spilling to disk. Simply populating the objects into DBIM improved the time by 1.5X; further tuning improved on this to provide an overall gain of 3.5X. The Receiving Transaction Processor had two long-running queries that reduced from 7.8 hrs to 4.85 mins representing about a 100X increase in performance. The overall runtime was about 4X faster. One of the key aspects in the paper is describing how to use Oracle E-Business Suite Application Affinity with Oracle RAC. It describes how to overcome some of the limitations of Non-Engineered Systems (commodity hardware), and explains how it can also be used to benefit Oracle Engineered Systems. The Oracle Database In-Memory blog contains a wealth of generic information, technical details, ideas and news on Oracle Database In-Memory from the author of the Oracle White Paper on Oracle Database In-Memory. E-Business Suite is a stable and mature ERP platform and many organizations are very satisfied with their current release. Despite this, many Oracle EBS find themselves forced to upgrade just to stay on a supported version from the vendor. BrightStar delivers scheduled updates for Oracle E-Business Suite applications including Payroll for the US and UK —as well as unscheduled, ad-hoc updates for special time-sensitive changes from national, state/provincial, and local agencies. 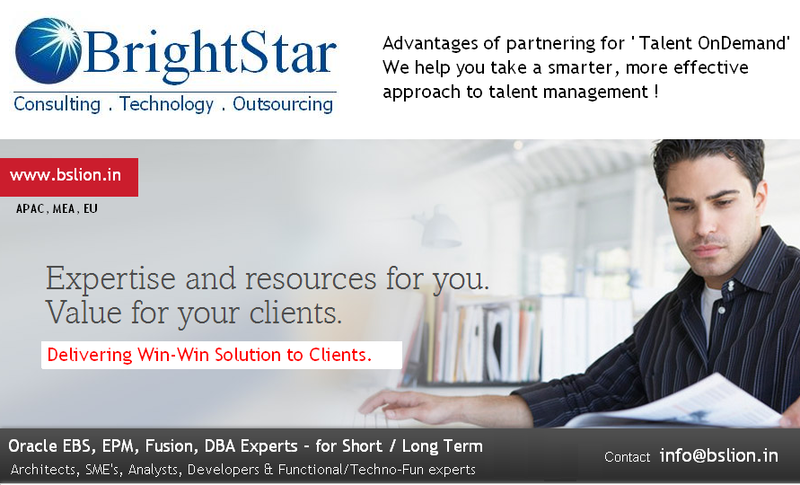 BrightStar experts are standing by to answer your E-Business Suite support questions. Contact us at info@bslion.in today to avail services. Successful ERP reporting is an important step toward the success of any distribution business. How well do you know your business? What did you do today to make it better? How did you measure the improvement through your distribution ERP system? What should you work on improving tomorrow? Successful reporting is the key to answer these questions. Inventory reporting is important to most businesses but it is especially so in the distribution industry. You don’t just want the right product in the right place; you want to know it was transported to that place only a second ago and is already on its way toward the outbound dock door. At the executive level, distribution ERP reporting should be monitoring inventory turns. Look at overall turns and the top and bottom 10% of your inventory. The bottom slowest movers might be candidates to wean out. Can you return them or push your customer to ship them as a fire sale item? Don’t wait for dust to settle on the box. The fastest movers are the stars. What can you do to get the next 5% to that rate? Who are the customers? How can you get more like them? How can you get more of their products? Sales, warehousing, and finance all need to see the data at macro and micro levels. Incoming orders are important. They represent tomorrow’s paychecks. How many orders per day do you get? Is the flow regular or erratic? How much effort is needed to input an order? Do you need clerks to receive orders or can your customers enter them directly to your distribution ERP. When the order is in place, what reports are needed to get that order to your pickers? What would it take to have orders automatically placed by your customers and no changes accepted because the order is already on the FedEx truck? Sales ought to be watching these metrics along with top management. Shipping is the reason your business exists. Measure lines shipped over time. Measure perfect orders shipped rate. Measure the throughput time from order to ship. Now use ERP reporting to disseminate all this information to the right departments. The warehouse needs this ERP data to manage throughput. Sales can use it in market distinction from the competition. How about customer relationship management? Do you have a metric for customer satisfaction? Not just if their order shipped on time but are they really happy to do business with you and will they recommend you to their friends? The C-level folks should know. Sales should also watch for prospecting, marketing, selling rates, customer retention. Find simple metrics such as calls per rep per day and use them in targeted reports – that is the key to unlocking the potential of ERP reporting. Don’t forget profit. What do you earn per account? How about earning per order or per day? You are in business to make a buck. Pay attention to how many you have left in your wallet.